A new study suggests the massive star that became the Cassiopeia A supernova remnant may have turned inside out as it exploded. Comparing a "before" artist's illustration with an "after" image from Chandra shows key elements are in different areas following the explosion. These results are based on a million seconds of Chandra observing time. A new X-ray study of the remains of an exploded star indicates that the supernova that disrupted the massive star may have turned it inside out in the process. 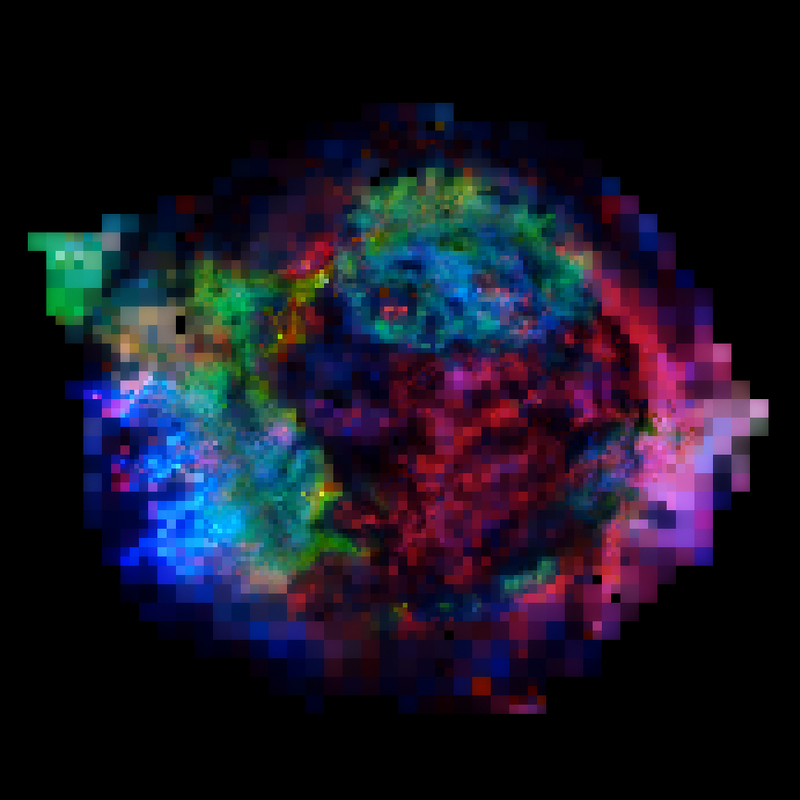 Using very long observations of Cassiopeia A (or Cas A), a team of scientists has mapped the distribution of elements in the supernova remnant in unprecedented detail. This information shows where the different layers of the pre-supernova star are located three hundred years after the explosion, and provides insight into the nature of the supernova. An artist's illustration on the left shows a simplified picture of the inner layers of the star that formed Cas A just before it exploded, with the predominant concentrations of different elements represented by different colors: iron in the core (blue), overlaid by sulfur and silicon (green), then magnesium, neon and oxygen (red). The image from NASA's Chandra X-ray Observatory on the right uses the same color scheme to show the distribution of iron, sulfur and magnesium in the supernova remnant. The data show that the distributions of sulfur and silicon are similar, as are the distributions of magnesium and neon. Oxygen, which according to theoretical models is the most abundant element in the remnant, is difficult to detect because the X-ray emission characteristic of oxygen ions is strongly absorbed by gas in along the line of sight to Cas A, and because almost all the oxygen ions have had all their electrons stripped away. A comparison of the illustration and the Chandra element map shows clearly that most of the iron, which according to theoretical models of the pre-supernova was originally on the inside of the star, is now located near the outer edges of the remnant. Surprisingly, there is no evidence from X-ray (Chandra) or infrared (Spitzer Space Telescope) observations for iron near the center of the remnant, where it was formed. Also, much of the silicon and sulfur, as well as the magnesium, is now found toward the outer edges of the still-expanding debris. The distribution of the elements indicates that a strong instability in the explosion process somehow turned the star inside out. This latest work, which builds on earlier Chandra observations, represents the most detailed study ever made of X-ray emitting debris in Cas A, or any other supernova remnant resulting from the explosion of a massive star. It is based on a million seconds of Chandra observing time. Tallying up what they see in the Chandra data, astronomers estimate that the total amount of X-ray emitting debris has a mass just over three times that of the Sun. This debris was found to contain about 0.13 times the mass of the Sun in iron, 0.03 in sulfur and only 0.01 in magnesium. The researchers found clumps of almost pure iron, indicating that this material must have been produced by nuclear reactions near the center of the pre-supernova star, where the neutron star was formed. That such pure iron should exist was anticipated because another signature of this type of nuclear reaction is the formation of the radioactive nucleus titanium-44, or Ti-44. Emission from Ti-44, which is unstable with a half-life of 63 years, has been detected in Cas A with several high-energy observatories including the Compton Gamma Ray Observatory, BeppoSAX, and the International Gamma-Ray Astrophysics Laboratory (INTEGRAL). These results appeared in the February 20th issue of The Astrophysical Journal in a paper by Una Hwang of Goddard Space Flight Center and Johns Hopkins University, and (John) Martin Laming of the Naval Research Laboratory. Would this not indicate that the explosion originated at the core and is a manifestation of the heaver elements simply moving farther from the center due to inertia? I am surprised, by the rating of others. It is a very interesting observation, and an example of the unexpected. A perfect opportunity, to spot something new,and work out what happened.